Post written by Shusei Fukunaga, MD, PhD and Yasuaki Nagami, MD, PhD from the Department of Gastroenterology at Osaka City University Graduate School of Medicine in Osaka. Our study focused on the long-term outcomes, risk factors for mortality, and adverse events for patients with expanded-indication lesions of differentiated-type early gastric cancer (EGC) who underwent endoscopic submucosal dissection (ESD) or surgical treatments. Although ESD for expanded-indication lesions of differentiated-type EGC has been widely accepted, no prospective randomized study has been conducted on this subject. Moreover, randomized control trials are ethically difficult to conduct because of the significant differences in treatment invasiveness. Thus, we conducted the present study using a propensity-matched analysis to reduce the selection bias because the relationship between mortality and therapeutic method could be affected by various confounding factors. After propensity-score matching, the 5-year overall survival rate was higher in the ESD group than in the surgery group. We also found that surgery was significantly associated with mortality using both the IPTW method, and Cox analysis. Significantly fewer adverse events were associated with ESD than with surgery. No cause-specific mortality was observed in either group. 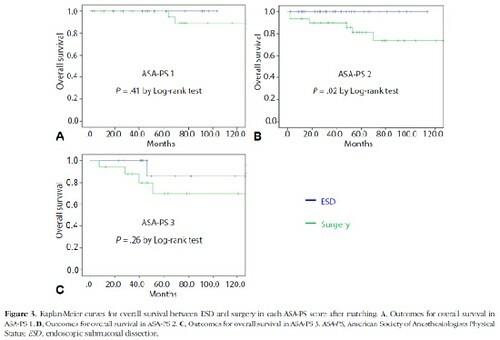 Moreover, the sub-analysis of the study revealed that the ESD group showed a significantly longer survival than the surgery group in patients with a poor American Society of Anesthesiologists Physical Status (ASA-PS), though the long-term outcomes of ESD in patients with ASA-PS 1 were comparable to those of surgery. Our results indicate that ESD might be an alternative treatment modality for expanded-indication lesions of differentiated-type EGC because of its favorable long-term outcomes without severe adverse events compared with those of surgery.